These last few weeks I’ve developed a tumultuous relationship with my sinuses played out through vigorous nose-blowing and ineffective hacking. After almost definitely reaching my max intake of alkaseltzer and nasal spray I thought it may be more effective to try the proven Bloom method of just whippin' together our own herbal remedy that we can safely slather all over our body without fear of overdose warning. Enter the earth bae version of good ol' vapor rub. My sad sack of sinuses are v pleased with this lil recipe and I hope it may too save you from having to desperatley use yr tshirt as a snot rag every night at the gym. This herbal vapor rub upgrade requires a few base oils (as thickening agents) and then a handful of relieving essential oils. Our essential oil blend is based on their effectiveness as inhalants, specifically to help heal respiratory problems or infections, open and sooth our inflamed lungs, and fight against bad bacteria which may be prolonging our sickness. These essential oils also have dominant effects on our brain game, by reducing stress, stimulating blood flow, elevating spirits, and eliminating fatigue- basically everything you’re forced to feel when having to blow said nose 100 times a day. And while of course no essential oils should be directly applied to the skin, these oils are added to our super soother beeswax and coconut base, both champions in skin care and cell repair. Rosemary works overtime here as a mental bless up and respiratory reliver. When rosemary oil is inhaled, it’s scent has shown to provide relief from throat congestion and other respiratory ailments via allergies, colds, and the flu while effectively treating respiratory infections due to its antiseptic properties. Inhalation of this herb can also boost the immune system by stimulating our antioxidant activity and decrease cortisol levels, which helps to manage free radical activity necessary in warding off diseases. Cortisol being a main stress hormone, Rosemary’s ability to lower those levels in our body helps to battle chronic stress or fatigue brought on by a hormone imbalance. At the same time it is effectively boosting our mental activity and neural concentration through stimulation. Eucalyptus is another respiratory superhero, as its an antibacterial, anti fungal, antiviral, anti-inflammatory, and decongestant by nature. Massaging eucalyptus oil onto the chest can work to calm the throat, relieve chest inflammation, and dilate blood vessels so that more oxygen may enter the lungs. Also a mental stimulate, eucalyptus works to allieve exhaustion and treat stress through its cooling effect and ability to stimulate blood flow. This same cooling effect can be experienced to reduce body tempteture and treat fevers. Providing a clean and calming aroma, lavender is an excellent essential oil choice for inhalants. This herb has a well-researched effect on the nervous system, shown to help treat headaches, depression, nervous exhaustion, and restlessness. An antibacterial, lavender can also be effective when treating respiratory ailments: its stimulating nature works to relieve congestion by loosening phlegm to be eliminated from the body, as well as fighting off respiratory tract infections. Further, lavender can relieve pain created through hypertension (who else always feels so sore when they’re sick?!). I happened to have calendula oil readily available, but if you don’t it’s easy to swap out for another such as almond or jojoba. Calendula oil is extracted from marigold flower tops and does not have an immediately fragrant scent. However it has long been used for healing purposes and can be a great agent when dealing with both external and internal repair. Both anti-viral and anti-microbial, it is also anti-inflammatory that can sooth lungs and help to reduce respiratory swelling when applied to the chest region. Beeswax is used primarily as a thickening agent for this, but also provides an array of skin benefits relevant to exhausted areas around and below our face. An anti-allergenic, it is easily tolerated by sensitive skin. When applied, beeswax can work as a protective barrier from bacteria, while also holding in moisture and reducing dryness. High in anti-inflammatory properties and Vitamin A, beeswax is the perfect cure for dry, dead, blister-red skin that needs to be soothed and repaired. While coconut oil has a million billion benefits that we never stop referencing, a few standout reasons to include this as in our vapor rub is its high content of Vitamin E and proteins, which encourages the repair and regrowth of damaged skin cells. Being antimicrobial, coconut oil can also help to protect our skin from further infections. 1. 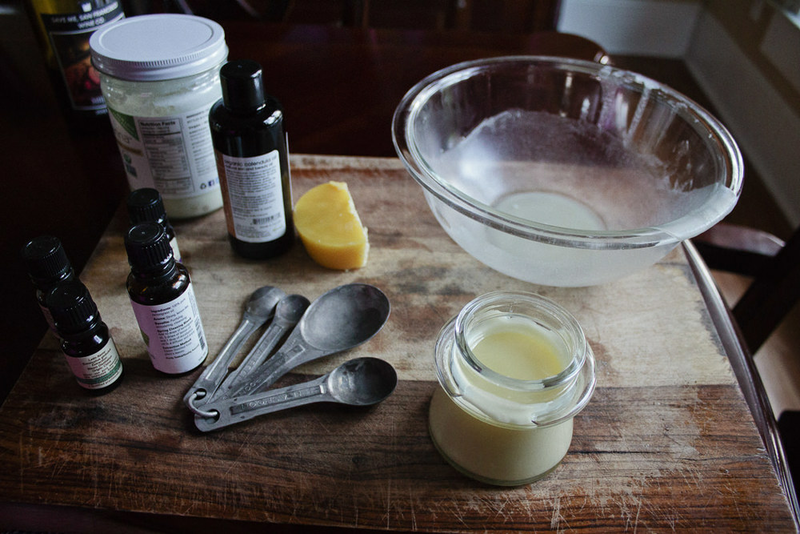 In a double boiler, warm the beeswax and coconut oil until it is in complete liquid form. 2. Add in the calendual and essential oils to your bowl, combine well. 3. Immediately pour mixture into container of choice before it can solidfy. 4. Rub all over yr chest, neck, shoulders, back, feet, hands, forehead, etc.